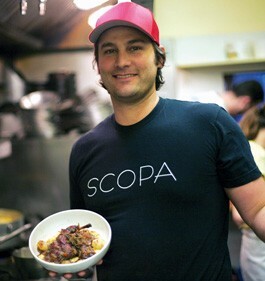 HUTCH TO HEARTH: Chef Ari Rosen at Scopa. 'Mark calls whenever he has some rabbits for me, and I buy them,' he says. There I was a short year ago, a recently lapsed vegetarian of eight years, in my kitchen staring down the carcass of a freshly slaughtered braising rabbit from Devil's Gulch Ranch in Nicasio. I had been tasked with the job of testing recipes for a sustainable-meat cookbook I was editing, and I'd procrastinated and postponed this particular dish—rabbit with bacon sage dumplings by New Orleans chef Donald Link—until the bitter end. Over the previous six months, I'd reintroduced meats into my herbivore diet, including chicken, beef, pork and lamb. Why then was I so flummoxed by the idea of putting a knife and fork into a piece of rabbit? It wasn't a moral or ethical dilemma for me, as it is for some; it was an emotional one. The thought of rabbit brought to mind (in order of importance) Watership Down, The Velveteen Rabbit, Thumper, chocolate Easter bunnies and my first-grade class pet Mopsy. It was a formidable hurdle. I did, however, finally gather my courage. I cooked it to braised perfection. And with my very first bite, I became a convert. It took me 36 years to fall in love with rabbit, and fall I did. Like timber. It seems I'm not the only one to come to rabbit late in life—and with some trepidation. Just last May, the New York Times ran a cover story on the critter's rising local popularity titled "Don't Tell the Kids." Though rabbit clearly hasn't shed its stigma completely, in the past few years it's been popping up more in restaurants and markets across America, and in particular culinary hubs like New York, Chicago and the Bay Area. "Five years ago, rabbit was a very hard sell," says chef Ed Vigil of Vin Antico in San Rafael. "Now it's the only constant on my dinner menu." As well as restaurants, the North Bay is also home to arguably the best rabbit farmers in the country. 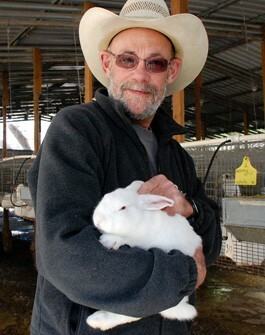 Mark Pasternak and his wife, Myriam, have been raising rabbits on their Devil's Gulch ranch in West Marin since 1997. The couple's reputation among the area's best chefs can only be described as impeccable; demand for their rabbits is unparalleled in these parts, far outweighing the supply. FROM THE SOURCE: Mark Pasternak and friend at his West Marin ranch. "I'll take them whenever I can get them," says Christian Caiazzo, chef and owner of Osteria Stellina in Point Reyes Station, and he's not the only chef willing to be patient. "The deal is, Mark calls whenever he has some rabbits for me, and I buy them. That's how it works," explains chef Ari Rosen of Scopa in Healdsburg. It's a 10-minute drive from the town of Nicasio to the Pasternaks' front gate, where Devil's Gulch occupies 65 acres of hilly countryside. Beyond the gate, a dirt road leads past rows of Pinot grapes and a group of pigs grazing freely on a knoll. Eventually, an enclave of old barns appears, restored at least twice in the four decades since Mark bought this land for the unfathomable sum of $550 an acre. Mark keeps his rabbits in a converted horse barn, with rows of hutches lined up beneath translucent panels of roofing and open siding to bring natural light and fresh air into the space. "It began with my wife getting a few rabbits for my daughter's 4-H project 13 years ago, and it just took off from there," Mark explains. A French chef came to dinner one night, sampled their rabbit, and asked if he could buy some for his bistro in San Francisco. Pretty soon restaurants like Quince and Chez Panisse came knocking. The Pasternaks' herd is 8,000 strong. But raising a commercial number of healthy rabbits is challenging—and not cheap. "People think it must be very lucrative because of how prolific rabbits are. But Mother Nature made them so they breed like rabbits because they are so fragile and die very easily," says Mark. He attributes most of their success to the fact that Myriam is an excellent rabbit veterinarian and has kept their herd uncommonly hearty, staying hormone- and antibiotic-free. On a smaller scale, however, rabbits are both relatively inexpensive and low-maintenance. This is why backyard hutches were so prevalent during World War II, when money and food were in short supply. Following the war, rabbits became branded as "poor man's food." Production waned. Thanks to voices like Oakland's Novella Carpenter, author of Farm City: The Education of an Urban Farmer, the notion of raising rabbits for home use has started to regain popularity. Rabbits are generally cleaner, quieter and less smelly than chickens, not to mention much easier to slaughter. As it turns out, they're also very environmentally friendly; natural foragers and herbivores, they'll eat plants and leaves that other animals won't. According to Slow Food USA, rabbits can produce six pounds of meat on the same amount of feed and water it takes a cow to produce just one pound. Rabbits "really are one of the most sustainable animals to raise for meat," confirms Samin Nosrat, a Bay Area chef who teaches a rabbit-cooking course, often in partnership with Carpenter or the Pasternaks. "And if prepared correctly, they're delicious." "The taste of rabbit is often compared to chicken or turkey, but that is really a disservice to the rabbit," says chef Staffan Terje of San Francisco's restaurant Perbacco, another devoted customer of Devil's Gulch. Rabbit has always been a staple on Perbacco's menu. Years ago, however, Terje once offered rabbit as a main course on Easter, and "this little girl started sobbing because her mom told her that they were having the Easter Bunny for dinner," he says. "That girl wouldn't stop screaming and calling me an 'Easter Bunny killer.' I learned my lesson. Now I never serve rabbit on Easter—just every other day of the year." It all goes back to that emotional dilemma. People often ask Myriam how she can eat something so cute and pretty. I've recently adopted her go-to response: Why would I eat only ugly things?